The Stenographer exam was conducted on scheduled date and time as mentioned in admit card and language of exam was Hindi & English (expect part III). SSC Stenographer exam was an objective exam of MCQ paper containing four alternative answers and candidates were required to select one correct answer among them. The OMR sheets had circles which were to be filled by blue /black point pen. The total 200 questions were asked from GI & Reasoning (50 questions), General Awareness (50 questions) and English language (100 questions). SSC Stenographer exam was held in morning session from 10 am to 12 noon. Total time duration for exam was 2 hours. There was a negative marking of 0.25 marks for each wrong answer delivered in the examination. SSC Stenographer Scorecard 2018 for Grade C & D posts: The latest news is that SSC Stenographer result and scorecard is getting uploaded after verifying / matching OMR answer sheet with the correct answers. This result and scorecard is predicted to be available soon with marks list and category wise cut off marks of the candidates. Procedure to download SSC Stenographer Result 2018: It can be predicted easily that SSC will declared result of Stenographer (Grade C & D) in PDF file in which roll numbers and name of the candidates will be provided with further information/ instructions to the list of selected candidates to be called for next stage of selection for these posts. The direct links are given here which will move you to the official page where you can download your result/ scorecard/ merit list of candidates. Then you can download and open your result PDF file. Check your roll number or name in this list and read carefully the instructions provided by the commission. The latest is that staff selection commission as declared skill test and document verification admit card for the post of stenographer on official website www.ssc.nic.in. The skill test for typing test will be held April / May 2018. The document verification will be held from 9th April to 19th April 2018. The admit card has been released which can be downloaded by using registration id or roll number and date of birth or name, father name and date of birth of the candidate. SSC Stenographer 2016 document verification admit card all regions like central region and rest of regions have been available now. In the document verification candidates required to bring all the original documents at the venue of scrutiny of documents. All educational certificates, caste certificates, experience and other certificates like photo ID proof, application form (submitted for SSC Stenographer recruitment 2016) will be checked by the officials for evaluating the originality of the candidate. In case any candidate is found guilty in any respect he or she will be shorted out from this recruitment and candidate will not be considered for further recruitment processes. It is advised to the candidate to bring a set of self attested copies of all original documents at the venue. Bring colour passport size photograph 2 or 3 with this set of photo copies of documents. The good news is that SSC Stenographer Skill Test result has been declared on www.ssc.nic.in. The schedule for document verification of SSC Stenographer will be mentioned shortly on the official website. · Stenographer Grade ‘C’: up to 5% mistakes for UR and up to 7% mistakes for all reserved category candidates. · Stenographer Grade ‘D’: up to 7% mistakes for UR and up to 10% mistakes for all reserved category candidates. Finally SSC Stenographer Final result (Tier II) has been announce on 25th November 2016 at www.ssc.nic.in. On 17th August 2016, the exclusive news is that Staff Selection Commission has released scorecard for SSC Stenographer exam held on 03rd July 2016 on SSC official website at www.ssc.nic.in. Huge numbers of candidates are waiting for their scorecard and finally the commission has uploaded in which roll numbers and total marks has been provided. Earlier SSC has declared SSC Stenographer Result in which the candidates are shortlisted for skill test. The SSC Stenographer Skill Test date is just to be announced on the website with a notice in which date, time and skill test venue will be provided. However, SSC Stenographer Result has been uploaded on ssc.nic.in, few days ago but still the qualified candidate will have to pass two or more process to get finally selected for the advertised posts. SSC stenographer salary is also provided in the details provided on this page. It seems that SSC stenographer recruitment will be completed within next few months as the SSC Stenographer notification was released in 2015. SSC Stenographer online process was adopted to collect SSC application forms. The SSC Stenographer Cut off Marks has also been uploaded by the commission through a write up PDF file. In addition, the marks or SSC Stenographer scorecard has also provided for convenience of the candidates so that they can measure their performance in SSC Stenographer exam held on 03rd July 2016. Now the successful candidates are looking for SSC Exam date for Skill test. The exclusive news is that SSC has not publish any schedule / dates for SSC Stenographer skill test. The final SSC result declaration for Stenographer will be prepared only on the basis of SSC Stenographer exam held earlier. This does not means that the commission will not consider skill test and document verification section. These processes are also important and honestly, most of the candidates eliminates in these process due to lack of typing speed and original documents. SSC Stenographer Final Result 2015-16 Declared (03.05.2016): The biggest news is that SSC has released final result of departmental examination 2015. Earlier SSC Stenographer Departmental exam had conducted on 31st May 2015. As per notice officially released “The result of written part and skill Test in Stenography (Hindi / English) were declared and placed on the Commission’s website on 29.07.2015 & 10.11.2015, respectively.” The write up, result and marks has been uploaded now on website www.ssc.nic.in. Those candidates who had attended written test as well as skill test/ typing test can download their SSC Stenographer Final Result 2015-16 from direct link given here. 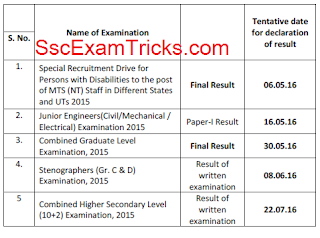 Grade 'C' Stenographers Limited Departmental Competitive Examination, 2015 - Declaration of Final Result. 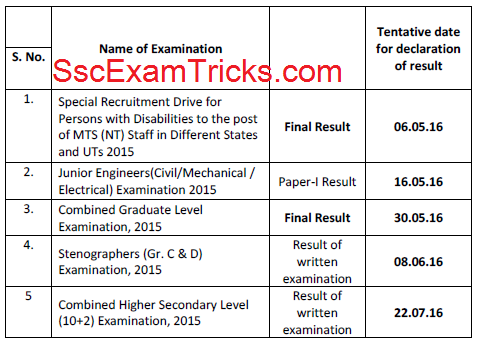 Grade 'C' Stenographers Limited Departmental Competitive Examination, 2015 - Mistakes in % in skill test. SSC Stenographer Result 2016 Declared: The breaking news is that SSC Stenographer Result for Grade C & D has been released on 28th May 2016 on website at www.ssc.nic.in. About 30522 candidates have qualified in this examination and these candidates are invited to attend skill test which is going to be organized soon. 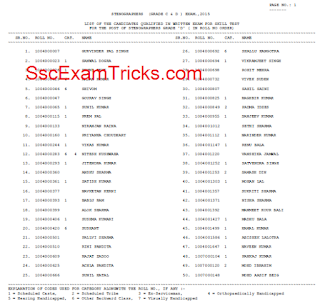 The SSC Stenographer result has been available in PDF file in which roll number, name and category of the candidates are given. 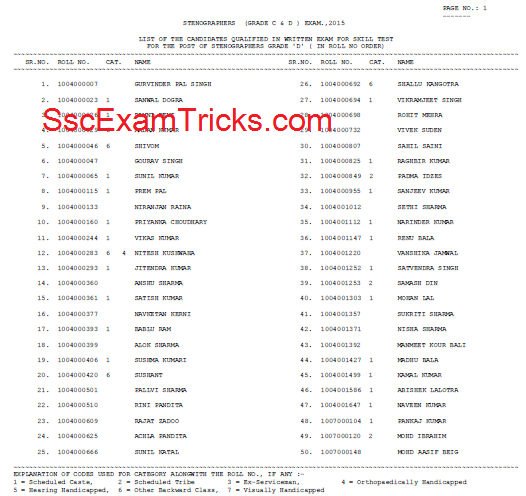 SSC Stenographer Result 2016 Grade C & D Merit List Latest News (April 2016): It has been observed that most of the websites on internet are claiming for SSC Stenographer result is going to be declared within few days or 2-3 days or first/ second/ last week of April 2016 or spread many other rumors to the genuine candidates. In regards of that SSC has finally announce tentative result date of SSC Stenographer Grade C & D Written exam 2016. From official notice, SSC Stenographer Result 2016 is going to be declared on 08th June 2016 with ‘Write Up’ in which category cut off marks will be mentioned to shortlist candidates for skill test or typing test exam on commission’s website www.ssc.nic.in. In this result, the typing test schedule or date or typing test syllabus / exam pattern will be provided. The official result date notice of SSC Stenographer Grade C & D Exam 2016 can be downloaded from direct link given here. See the image to verify the SSC Stenographer Result 2016 for Grade C & D posts. SSC Stenographer Grade C & D 2015 Result date (03.04.2016): From source, the result of SSC Stenographer Grade C & D is going to be available in few days (2-3 days) with the list of successful candidates to be called for typing test/ skill test. The skill test schedule will be mentioned with venue and SSC Stenographer skill test call letter date on the page. You must visit SSC Official website regularly to check the latest updates of SSC Stenographer Grade C & D Result 2016. It has been noticed that Staff Selection Commission (SSC) had took another milestone to successfully conducted written test of Junior Engineer (Civil, Electrical & Mechanical), Stenographer Grade C and D and Junior Hindi Translator in January 2016. The written test for Stenographer Grade C and D posts & Stenographer Grade C and D were conducted on 31st January 2016 at many exam centres across the country. Lakhs numbers of eligible and well qualified candidates have applied and appeared in these written examinations. Now, these candidates are waiting for SSC Result 2016 for Junior Engineer and Stenographer (Grade C and D) exams. SSC Stenographer 2015 Grade C & D Answer Keys (28.04.2016): The latest news is that SSC has uploaded stenographer exam answer keys on 28th April 2016 on ssc.nic.in. The written test was held on 31st January 2016 and answer keys of all sets has been uploaded now. The SSC Stenographer Answer keys can be downloaded by providing booklet serial number and submit representations. The online answer keys representations can be submitted up to 06th May 2016 at 06:00 PM. Those candidates who have been waiting for SSC Stenographer Answer Keys; they can download their online answer keys from direct link available here.